Milton Caniff Historic First Introducing Terry and the Pirates Daily Comic Strip Original Art (Chicago Tribune, 1934). 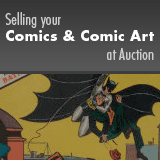 How often do you see such a landmark episode of an American icon for sale in the public marketplace? This adventure strip classic had its origins when Captain Joseph Patterson, editor for the Chicago Tribune Syndicate, who had admired Caniff's earlier work on Dickie Dare, hired the up-and-coming tyro to create the new feature. Milton Caniff's picaresque cast of characters for Terry has seldom been matched. For all the gritty realism of the art in Terry, the storyline always retained an air of fantasy with its exotic locales, bizarre villains, and romantic women. This museum-worthy episode has an image area of 20" x 6", and aside from missing most of its pasted-on syndicate notice in the first panel, the art is in Excellent condition. This strip is inscribed in its first panel, "Best wishes to Joe Bogats."